Geographically, Scotland is divided into three distinct areas: the Highlands, the Central plain (Central Belt), and the Southern Uplands. The Highlands cover the former; the Lowlands cover roughly the latter two. The northeast plain is also "low-land", both geographically and culturally, but in some contexts may be grouped together with the Highlands. In traditional Scottish geography, the Highlands refers to that part of Scotland north-west of the Highland Boundary Fault, which crosses mainland Scotland in a near-straight line from Helensburgh to Stonehaven although the exact boundaries are not clearly defined, particularly to the east. The Great Glen divides the Grampian Mountains to the southeast from the Northwest Highlands. The Scottish Gaelic name of A' Ghàidhealtachd literally means "the place of the Gaels" and traditionally, from a Gaelic-speaking point of view, includes both the Western Isles and the Highlands. The highlands were culturally distinguishable from the Lowlands from the later Middle Ages into the modern period, when Lowland Scots replaced Scottish Gaelic throughout most of the Lowlands. In the aftermath of the Jacobite risings, the British government enacted a series of laws that attempted to speed the process of the destruction of the clan system, including a ban on the bearing of arms, the wearing of tartan and limitations on the activities of the Episcopalian Church. Most of the legislation was repealed by the end of the eighteenth century as the Jacobite threat subsided. There was soon a process of the rehabilitation of highland culture. Tartan was adopted for highland regiments in the British army, which poor highlanders joined in large numbers in era of the Revolutionary and Napoleonic wars (1790–1815). Tartan had largely been abandoned by the ordinary people of the region, but in the 1820s, tartan and the kilt were adopted by members of the social elite, not just in Scotland, but across Europe. The international craze for tartan, and for idealizing a romanticized Highlands, was set off by the Ossian cycle, and further popularized by the works of Scott. His "staging" of the royal Visit of King George IV to Scotland in 1822 and the king's wearing of tartan resulted in a massive upsurge in demand for kilts and tartans that could not be met by the Scottish linen industry. The designation of individual clan tartans was largely defined in this period and they became a major symbol of Scottish identity. This "Highlandism", by which all of Scotland was identified with the culture of the Highlands was cemented by Queen Victoria's interest in the country, her adoption of Balmoral as a major royal retreat from and her interest in "tartenry". 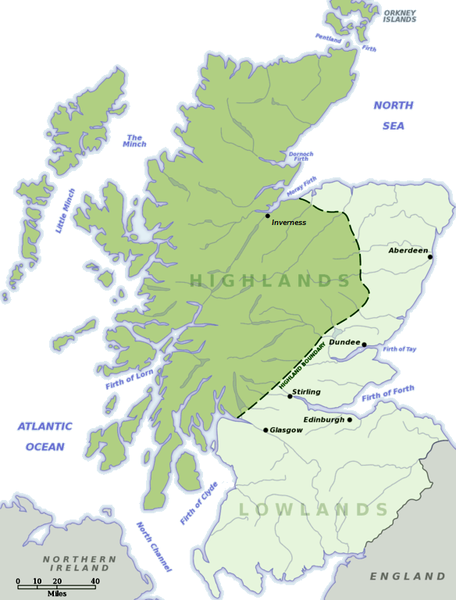 The Lowlands (Lallans or the Lawlands; Scottish Gaelic: a' Ghalldachd, "the place of the foreigner") is not an official geographical or administrative area of the country. However, in normal usage it refers to those parts of Scotland not in the Highlands. A much wider definition of the Highlands is that used by the Scotch Whisky industry. Highland Single Malts are produced at distilleries north of an imaginary line between Dundee and Greenock. This categorization includes the whiskies produced on the islands around the perimeter of Scotland (the Island Single Malts), except for Islay (see Islay whisky). Incongruously, the area also includes certain lowland areas in the North-East of the country such as Banffshire and Aberdeenshire.